Unlike our Multiglas-covered panels, this option gives you direct access to your displayed materials, allowing you to post or rearrange display items with ease. 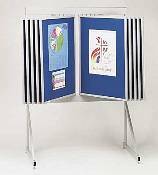 Available in your choice of nine colors, these display loop panels feature Velcro-like fabric mounted over tackboard and can be used with hook tab circles, hook tape or push pins. 10-Panel Loop Fabric Floor Display without Multiglas™ - 30" x 40"
10-Panel Loop Fabric Floor Display without Multiglas™ - 40" x 48"
20-Panel Loop Fabric Floor Display without Multiglas™ - 24" x 36"
20-Panel Loop Fabric Floor Display without Multiglas™ - 30" x 40"
20-Panel Loop Fabric Floor Display without Multiglas™ - 40" x 48"